Monica A. Coleman’s great-grandfather asked his two young sons to lift him up and pull out the chair when he hanged himself, and that noose stayed in the family shed for years. The rope was the violent instrument, but it was mental anguish that killed him. Now, in gripping fashion, Coleman examines the ways that the legacies of slavery, war, sharecropping, poverty, and alcoholism mask a family history of mental illness. Those same forces accompanied her into the black religious traditions and Christian ministry. All the while, she wrestled with her own bipolar disorder. 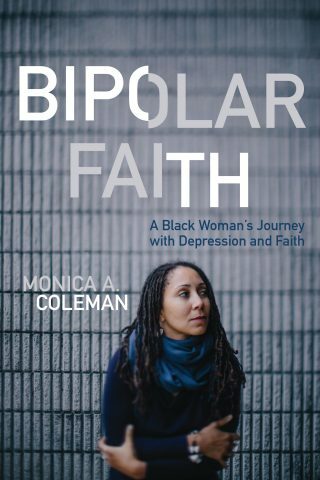 Bipolar Faith is both a spiritual autobiography and a memoir of mental illness. In this powerful book, Monica Coleman shares her life-long dance with trauma, depression, and the threat of death. Citing serendipitous encounters with black intellectuals like Henry Louis Gates, Jr., Angela Davis, and Renita Weems, Coleman offers a rare account of how the modulated highs of bipolar II can lead to professional success, while hiding a depression that even her doctors rarely believed. Only as she was able to face her illness was she able to live faithfully with bipolar. And in the process, she discovered a new and liberating vision of God.